2017 is almost gone and another successful Christmas Art Countdown is in the books! You can see the entire countdown below OR view the detail of each individual design in my Instagram feed. For last year's Christmas Art Countdown, my focus was split between hand lettering, patterns, and illustrations. However, after the overwhelmingly positive response to the few illustration pieces in my portfolio at Surtex, I've spent a lot more time working to develop my illustration skills. So this year, I focused a LOT more on drawing characters – there are 12 designs this year featuring character art (contrasted by 3 from 2016). I'm happy to say I feel much more confident creating character illustrations now. It's fun when you can look back over just a few months' work and see your designs progress. I'm also hoping that my shift in focus towards more illustrative work will land me more design contracts and commissions this year. Only time will tell if it's going to pay off! I probably sound like a broken record on this particular point, but pre-planning my designs really makes such a difference! I was presented with an especially difficult challenge this year by being out of town for the first 8 days of the countdown. Of course I was vacationing in Disneyland with my hubby which is hard to complain about, but that meant I had to do some serious art making ahead of time. Luckily, I found the time to finish the first 10 days of the countdown before we left. I also managed to sketch out all but the last 4 days in my sketchbook. Posting every morning while on vacation was surprisingly easy to remember. I think the most challenging part was coming home from Disneyland and immediately jumping back into daily designing. By the time the end of the countdown rolled around, I was just about out of creative energy (and am happy to take a break between now and the new year). Perhaps my favorite part of the challenge this year was opening up Instagram app each morning and looking through the #christmasartcountdown2017 hashtag to see the art my fellow designers were posting. Since it was the 2nd year of the challenge, there was a LOT more participation, which meant tons of beautiful art to scroll through. Seeing everyone's individual interpretations of the prompts and cheering them on all month long was really rewarding and it helped to keep my creative juices flowing. I really appreciate the surface design community on Instagram and look forward to cultivating even more friendships on there in 2018. So just like last year, I guess the big question is will the Christmas Art Countdown continue in December 2018? And right now, I'm not 100% sure. I quite enjoy the challenge of daily art making for 24 days (it's about as long as I think I can handle), but I have no idea what is in store for me next year. I guess we'll just have to wait and see! When I posted my completed Christmas art challenge last year, I wasn't sure if I'd be bringing back the challenge for 2017 because I had no inkling of how the following 12 months would play out. Fortunately, 2017 has been a tremendous year! I crossed my biggest artistic goal of exhibiting at Surtex off my list and am looking forward to a bigger and better year in 2018. And that's where the Christmas Art Countdown comes in! Just like last year, I'm utilizing this challenge as a way to create lots of new holiday art in a short time period. 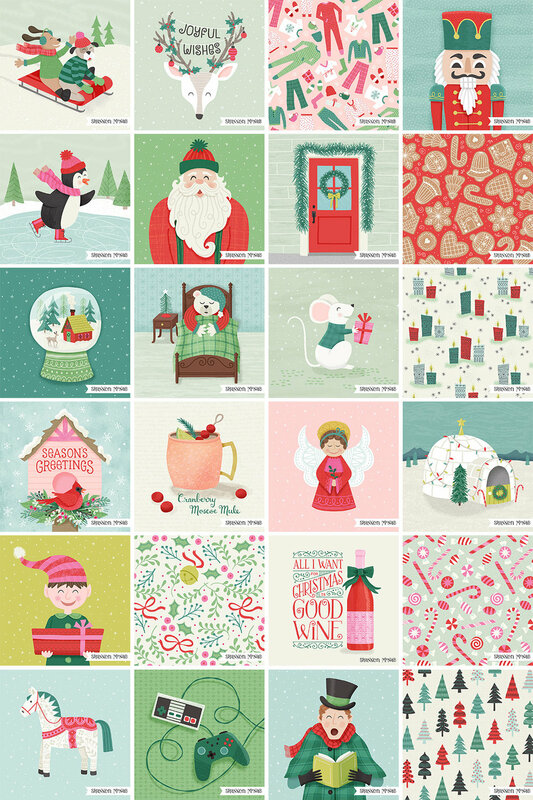 From the designs I created for 2016's Christmas Art Countdown, I added 16 of them to my portfolio; I'm hoping for a similar outcome this year. There's no difference made between illustration/pattern and hand lettering prompts. That's because I'm focusing on illustration and pattern work since I already have a fair amount of typography based designs in my portfolio. Of course, typography will inevitably creep in on some of them because I love hand lettering so much! The prompts are simpler. The reason for this was two fold: 1) I'm looking forward to sketching out multiple ideas for some prompts and hopefully a few of the final designs will be unexpected, and 2) I tried to choose words that could be interpreted in a number of ways. Variety is the spice of life after all! I firmly believe that the only way I was successful in posting daily images for the entire challenge in 2016 was all the pre-planning I did. And because I'll be on vacation (at Disneyland, of course) for the first week of the challenge, this year it's EXTRA important that I plan ahead! As a matter of fact, I've already sketched out ideas for the first third of the list and hope to have most of my prompt ideas in my sketchbook by the end of the month. My plan of attack is that by the time Dec 1st rolls around, I'll have at least the first 8 designs completed and ready for Instagram (which will make leaving for a week long vacation at the beginning of the challenge a little less stressful). While I really loved doing my own Christmas Art Challenge last year, what made it even better was seeing all the designs my fellow designers posted on Instagram. So with that, I'd love to encourage you to join me! Maybe you see a few prompts that inspire you or you want to challenge yourself to tackle the entire list – either way I'd love to see what you come up with! Feel free to pin the image above to Pinterest or share my post on Instagram so you'll remember the prompts for each day. And be sure to use the hashtag #christmasartcountdown2017 anytime you post your work so I can see your lovely designs! When I first decided on doing my own Christmas advent challenge in early November, I was a bit skeptical as to whether I would actually be able to keep up with it everyday for the entire length of the challenge. Well, I have to say, my first Christmas Art Countdown was a SMASHING success!! Not only was I able to post my designs daily to Instagram, but I managed to add 13 completed Christmas designs to my portfolio (and a few others that will be added after some tweaking). Here's the entire set of designs – you can see the detail of each individual design in my Instagram feed. And after spending a bit of time reflecting on my completed designs, I realized that the reason I managed to post daily was entirely due to all my pre-planning. In the past, I've discussed how I used pre-planning when I was designing digital scrapbook products, but I never thought to apply that wisdom to building my surface design portfolio until I created this challenge. Whoa, what a game changer! The first thing I did after finalizing my list in early November, was to pull together an easy-to-work-with color story so the entire set looked cohesive. I opted for a fairly traditional palette that focused on red, green, and tan with touches of blue and pink. Picking my color palette before the challenge started really helped determine the overall vibe of my designs. By the time December 1st rolled around, I think I had quick sketches of at least 50% of the prompts in my sketchbook which really helped me stay on track. And once December arrived, I'd spend an hour each weekend sketching any remaining ideas for the following week's prompts so I was prepared to complete each piece with plenty of time to spare. Step 3: Finish the daily prompts BEFORE the day it's "Due"
In all but one instance (Day 23: Santa), I finished each prompt 2-5 days beforehand. I'm one who never likes to play "catch up" as it causes me unnecessary stress and by creating my designs in advance of the actual prompt day, it meant I was more at ease when completing each piece. Another tip I should mention (maybe it should be Step 4), is that it's wise to take a break after completing such a daunting challenge. I had already planned on taking the week off between Christmas and New Years and I'm SO glad I did! I'm sure if I had planned any other design deadlines right after my challenge was over, I would have had a much different (& far less happy) experience. I guess the bigger question is will I be doing this challenge again in 2017? Since I have no idea what's in store for me in the new year (especially leading up to and even after Surtex in May), I'm going to wait until November to decide if I want to try the challenge again. I hope you all have a wonderful day celebrating the New Year! I'm really looking forward to 2017 – I already know it will be a year to remember. Cheers! It's been a few months since I announced that I'll be exhibiting at Surtex in 2017. Since then, I've been working furiously behind the scenes adding new work to my portfolio. And I know I'm taking a bit of an unconventional approach to Surtex as I've never before walked the show, yet I'll be exhibiting sight unseen, and that's why I've been soaking up as much information about the show as I can get my hands on. Perhaps the single most useful thing I've been told since starting my Surtex journey is that the majority of my portfolio should be focused on Christmas and floral themed designs. The advice was from Jennifer Nelson during one of her live Prep Talk sessions (if you are currently working towards exhibiting at any surface design show, these sessions have been so helpful and I HIGHLY RECOMMEND you sign up for them). Before hearing that, I was had no clear direction with how or what to build my portfolio with. And now??? You can bet I'm spending all December on nothing but holiday designs. And that leads me to my first ever Christmas Advent Challenge. At first, I thought I'd just join one of the many advent challenges already out there on Instagram. But I realized that since the whole point of this project is to build on my current body of work, I needed to focus on the types of motifs that would best benefit my portfolio. And because I love hand lettering almost as much as illustration and patterns, I was inspired by Dawn Nicole's monthly challenges to focus half the days on holiday typography. Also, by creating the list early (I created this graphic a few weeks ago), it's given me time to conceptualize design ideas and prepare for a month of daily art. I decided to post this challenge publicly because I'm hoping it will help me stay accountable and keep me motivated to create new designs every day. I'd also love to encourage you to join me in this challenge! Feel free to pin the image above to Pinterest or share my post on Instagram so you'll remember the prompts for each day. 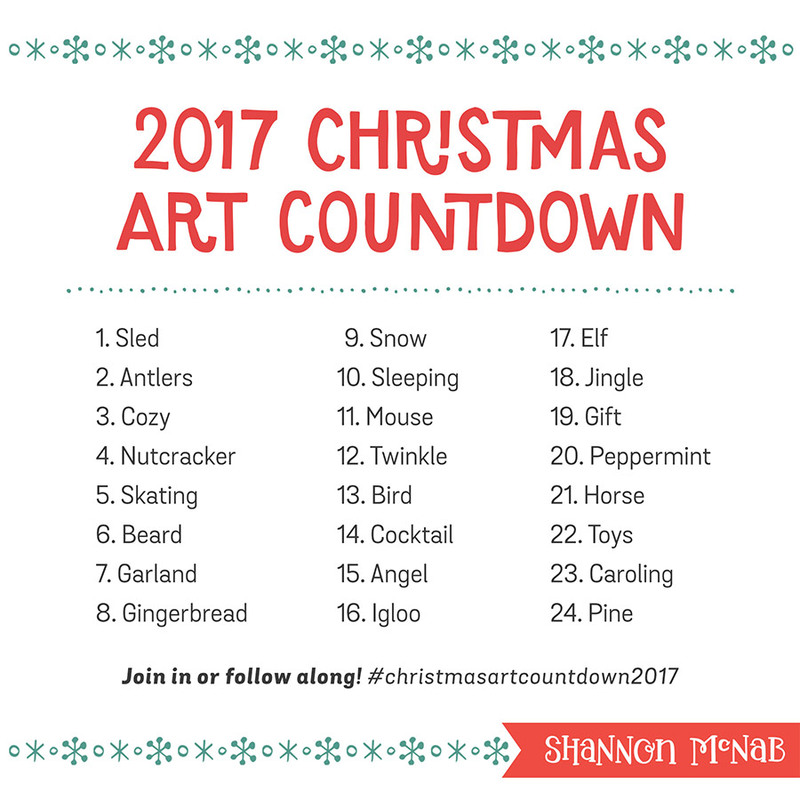 And be sure to use the hashtag #christmasartcountdown and tag me @smcnabstudio on Instagram anytime you post your work so I can see your lovely designs!